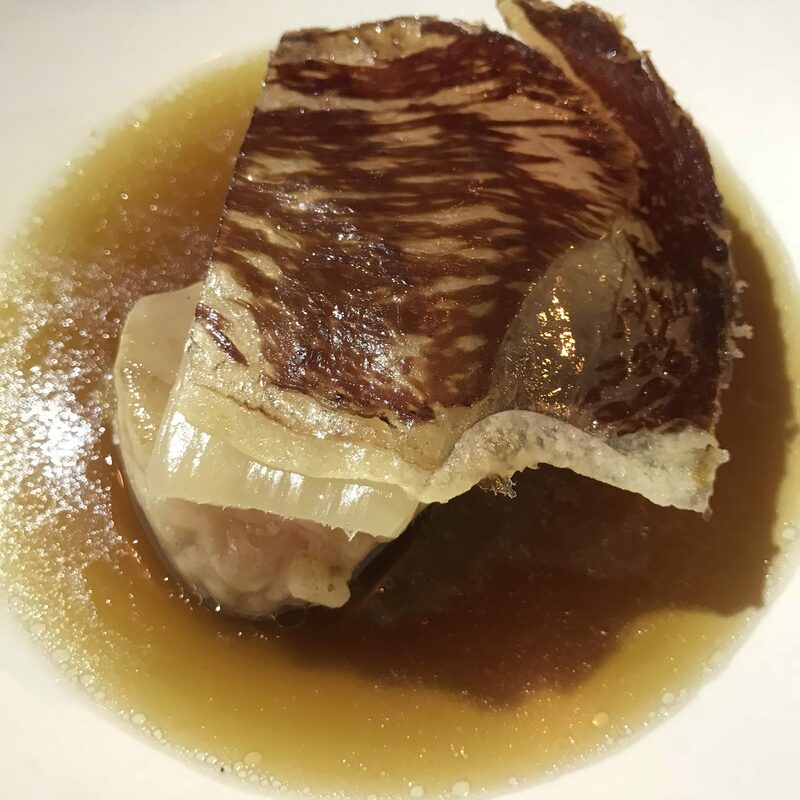 Recently, we dined at so many amazing restaurants in Morocco and France. It is difficult to select just one for the weekly restaurant review. I just have to expose my readers to Septime, the relaxed, sophisticated Parisienne gem. It is a remarkable restaurant, but so damn difficult to secure a reservation. There is nothing I enjoy more than a challenge. I called and emailed well in advance, but was shunned. The rules are that you can only reach out exactly 21 days before your due date. Septime only accepts reservation calls between 10am-noon and 5:30-7:30pm, GMT+1. I set my alarm for 4am EST. Yahoo, the phone was ringing without going straight to message…I was put on hold. My patience is thin at 4am, but within 5 minutes a charming frenchman who spoke impeccable English confirmed a 7:30pm reservation on November 26th. We arrived 10 minutes before the anointed time and a line had already formed. 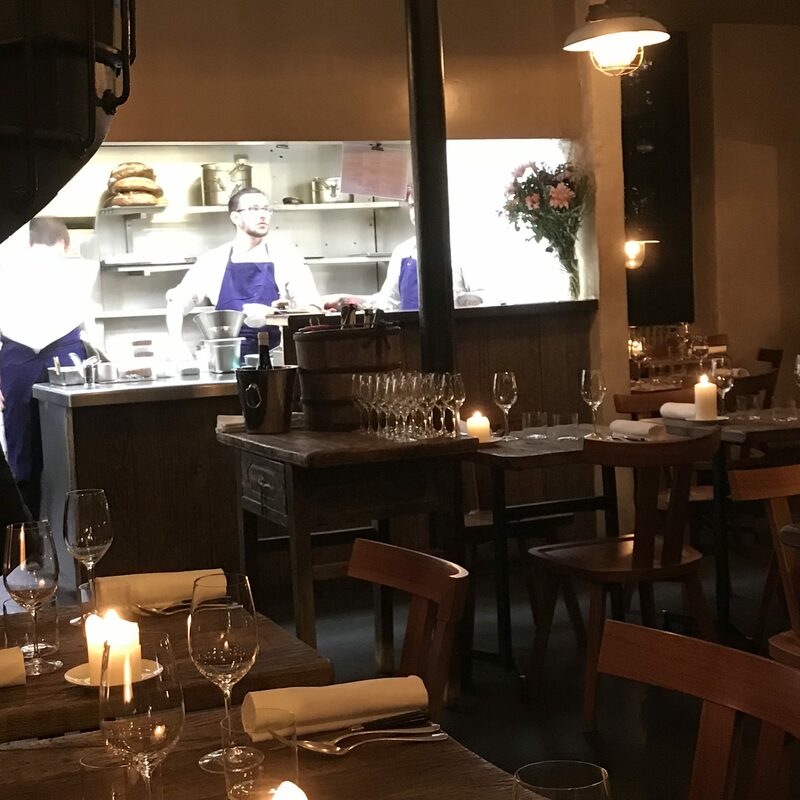 The restaurant is absolutely charming, the service impeccable and the food by young chef, Bertrand Grebaut (worked at L’Arpege, L’Astrance), is divine. 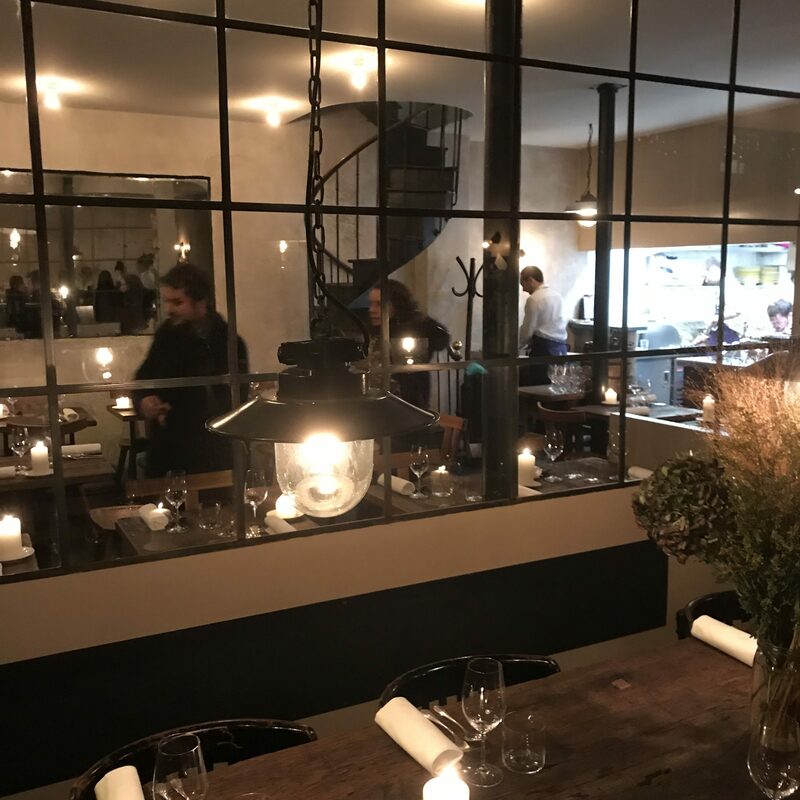 Septime was on the World’s 50 Best Restaurants List in 2016. 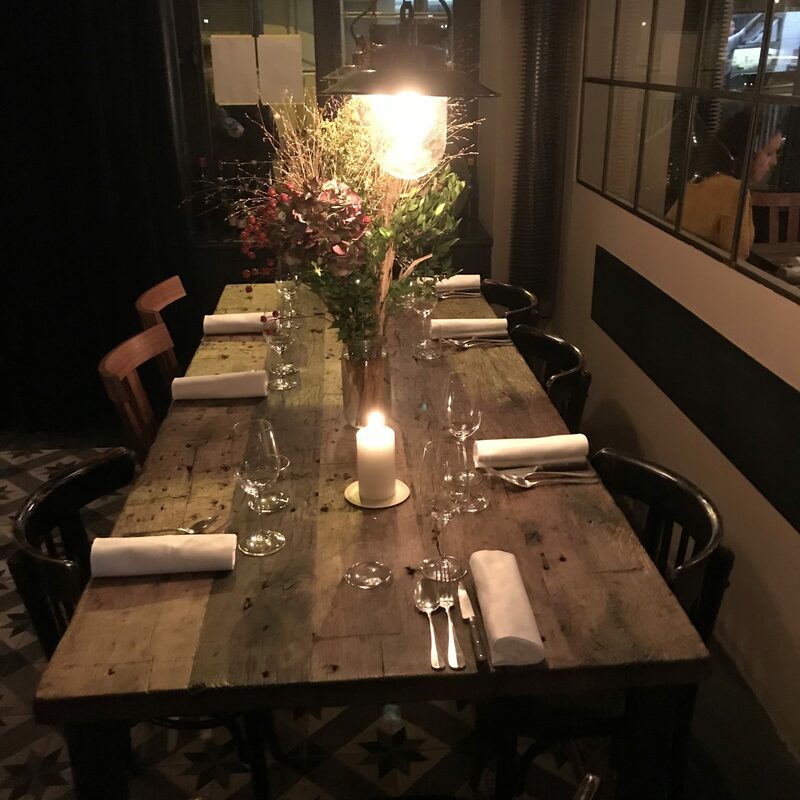 Septime serves a seven course fixed price menu, costing 80 euros with wine pairings for an additional 55 euros. 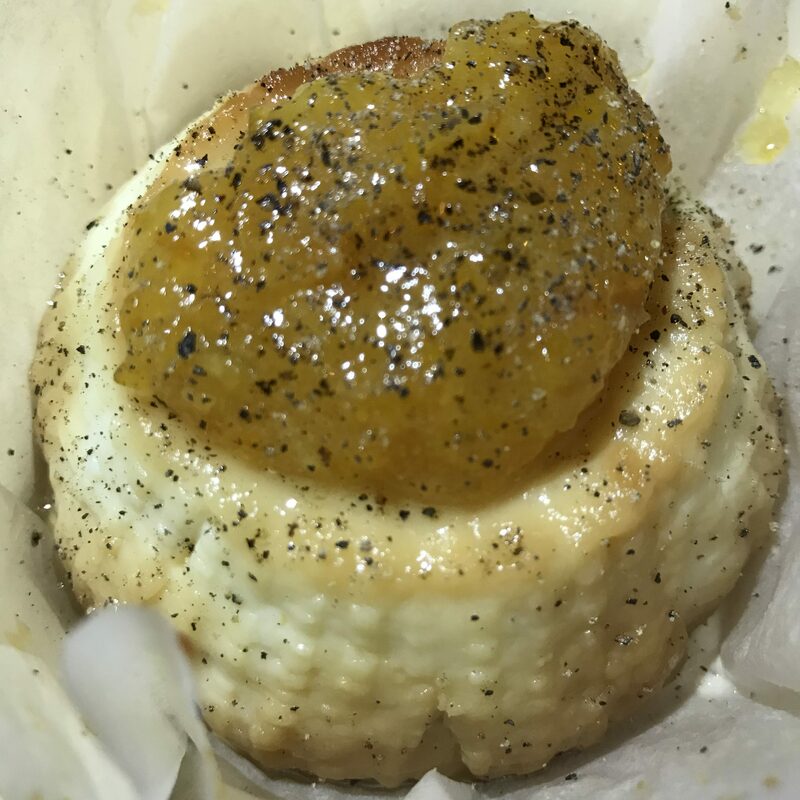 Each course is a surprise, only revealed when plates are served. We began with wine, but of course. What could be looked upon as treason, we selected an Italian Macchiona 2011 from Emilia-Romagna that was divine. I texted my Italian wine expert, Francesco, the suave owner of Sociale in Brooklyn Heights and he enthusiastically approved. 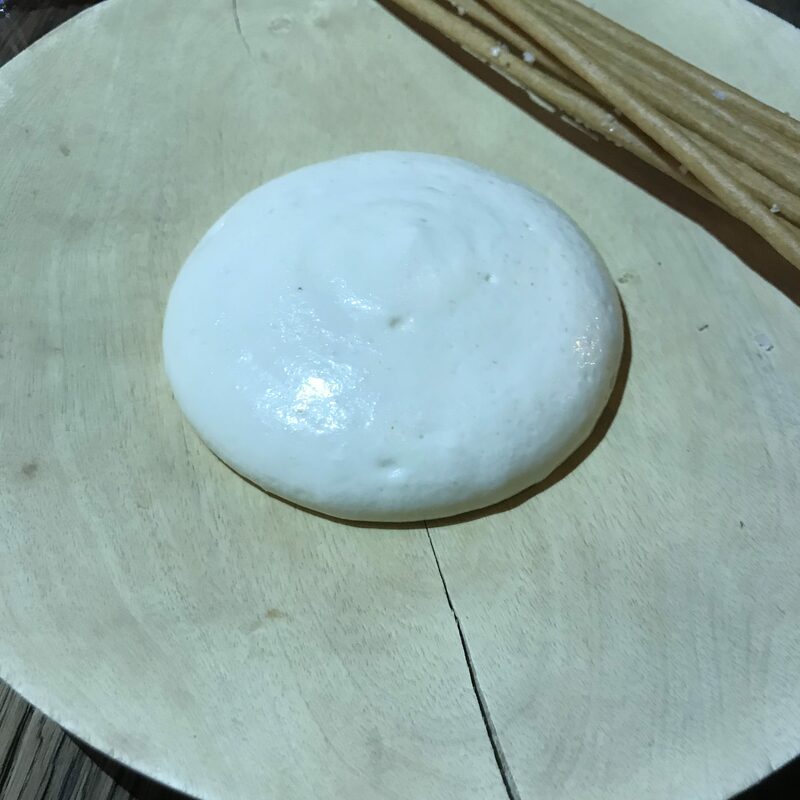 The server brought over a lovely Gouda cream with homemade breadsticks to kick off the seasonal menu. 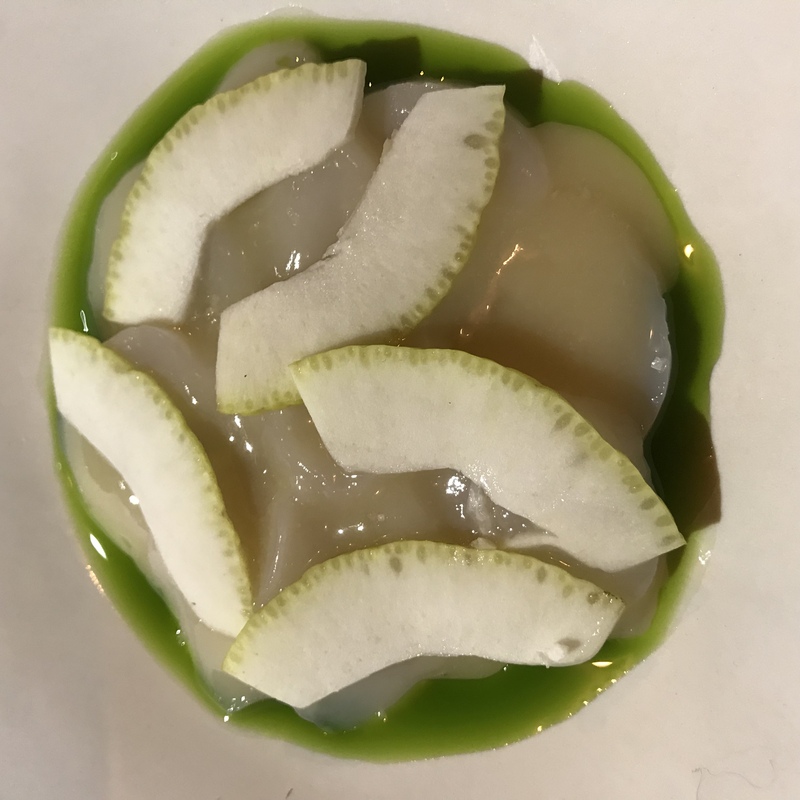 Our opening gambit was outrageous raw scallops with citron, seaweed and bathed in celery oil. 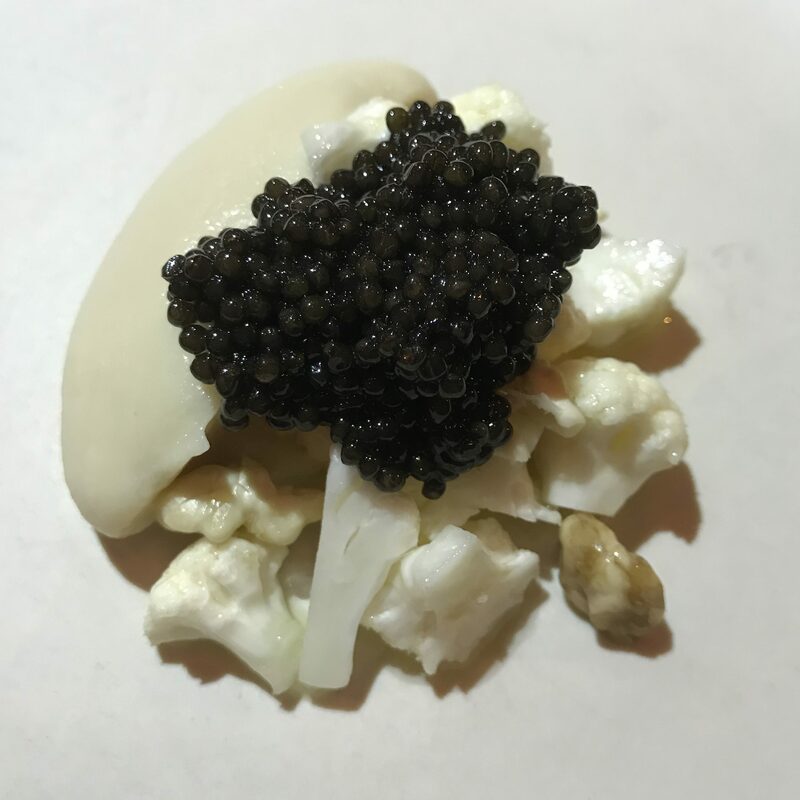 Next was a glorious Cauliflower dish with magnificent caviar from southwestern France…more caviar, please! 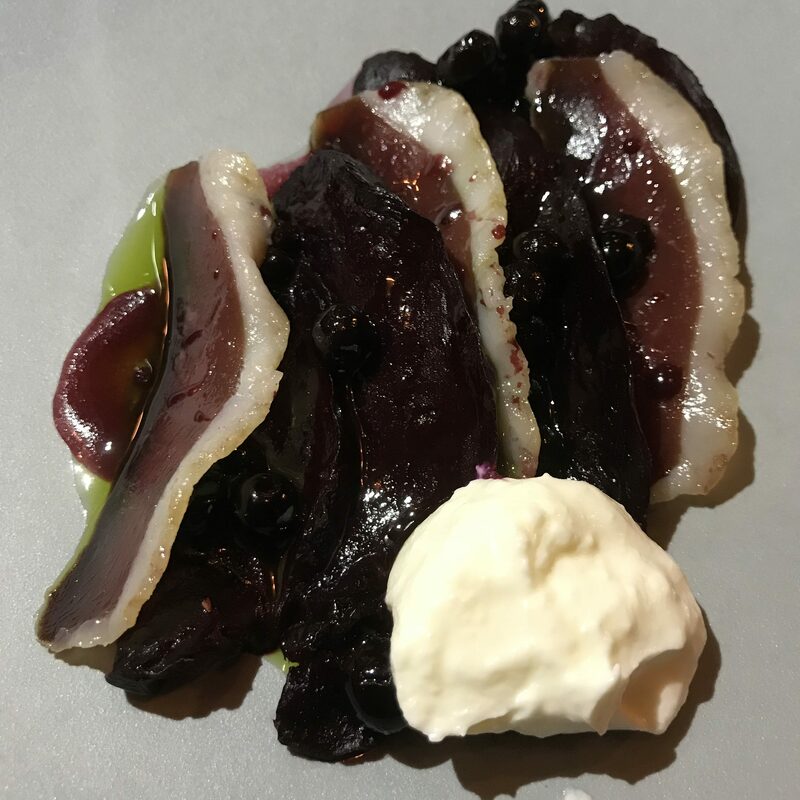 Beetroot with cured duck embellished with yogurt and blueberry rocked our world. Mushrooms were next on the hit parade enveloped by a Matelote sauce with fresh toasted sesame seeds, coriander and lentils…be still my heart. The final entree was an orgasmic Bone Marrow, sliced beef with a Swiss char pesto. 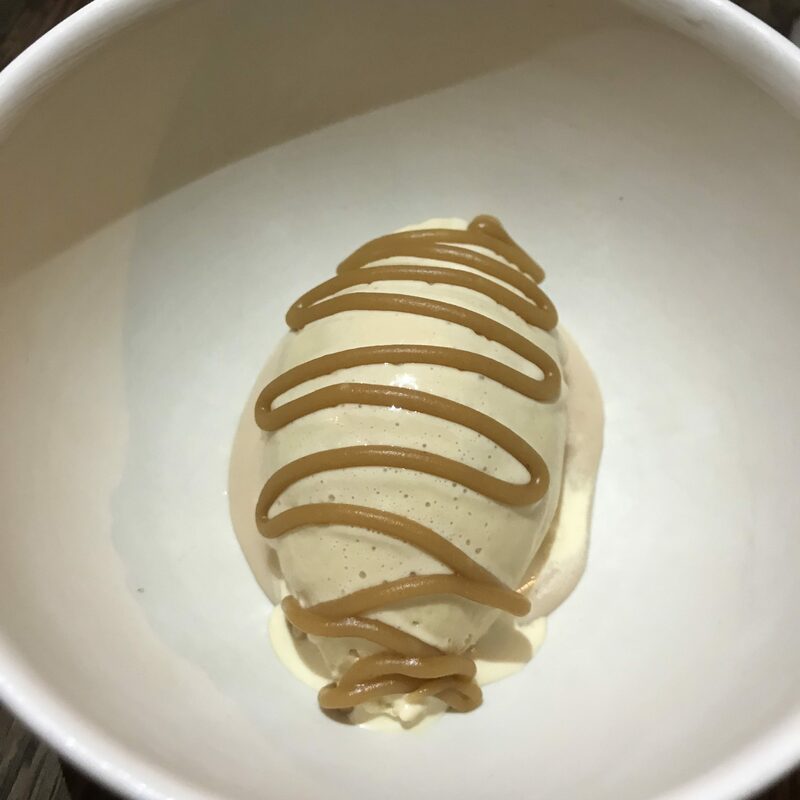 Dessert was a pepper oil mandarin jam as well as caramel ice cream. We passed on the additional cheese course. 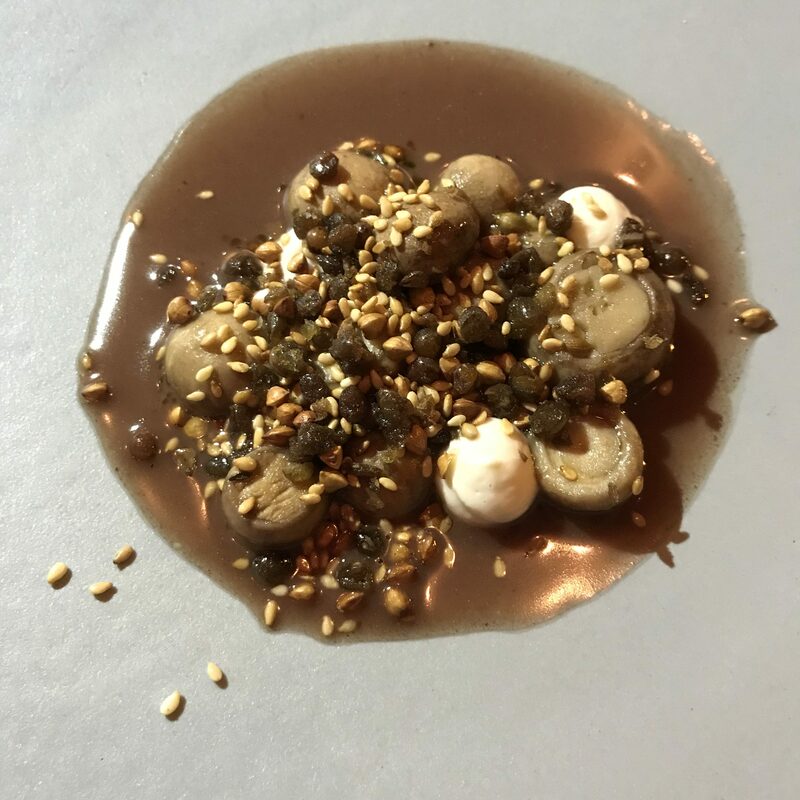 Septime is most definitely the #1 contemporary tasting menu in Paris and a uniquely satisfying, memorable dining experience. Septime 80 Rue de Charonne Paris, France. Open for dinner Monday-Friday 7:30-10pm, Lunch Tuesday-Friday 12:15-2pm. Closed Saturday and Sunday. Call 21 days in advance for reservation: 01 43 67 38 29.